I don't think I've mentioned it on here before, but from about December 2004 to August 2005 I played a game called World of Warcraft every day. It is an online game with millions of players. You play a character in a massive virtual world, and you go on adventures. Along the way you find people to quest with and pretty soon friendships are formed with these people you have never met physically, but spend hours with every day online. After a month of play I ended up in a guild. A guild is like a team - a bunch of people that have all formed up together to make it easier to carry out some of the quests and to make it easier to find people to head into dungeons with. The guild was called "Grief". Well, the guild leader quit playing one day without a word and so we were left without a leader for about a month. Then we held an election and somehow I was voted in to be the guild leader. I didn't do much in that position except to make jokes, try to make sure people had fun, help people out when they were in trouble, and show up drunk occassionally. It seems that is all I needed to do to have my character 'Saraa' make lots and lots of friends. It wasn't long before I'd enter a room and people would start saying stuff like "omg, it's Saraa!" I know it is just a game, but it was a pretty big ego boost sometimes to have a character that people had 'heard of' even if they had never met me. "Oh? What server were you in?" he said. "Daggerspine, you?" I said confidently. "Were you ever in Grief?" "Are you Saraa, the leader of Grief??" "... Yes... that's me." I said frightenedly. "My wife and I are in that guild!!" Sure enough, he was someone I met online over a year ago and we were suddenly face to face. I have to say that it was a pleasant surprise to see him in person after so many months of 'seeing' and 'talking' to him online. It's funny though, he works in a computer store and I am a computer programmer, both in land-locked Saskatoon Saskatchewan, but my most outstanding memory of him is when we chased some of The Horde off a cliff into the ocean in the southwest part of Desolace. I actually owe Grief and it's members a debt. It is strange to think a person discovering herself through a video game, but that is exactly what happened to me. When I started playing the game I was still very much the old me - shy, reserved, cautious. Soon though, as I related to everyone as a woman I discovered new parts to my personality. The old me was still in there - but now there was just a lot more! My main questing buddy was Jesse from work - or Redallion as he was known in the game - and one day he said to me that a cool part of role-playing gaming as opposed to regular online gaming is you get to see a person's personality come out in their character. I know he was talking about finally getting to know me as a person through the freedom the game lent me. I remember that statement well because I too finally got to know the real me through that game. That's pretty cool and actually quite touching. I love playing theSims2 and have always wanted to try an online game like that. My background is pretty much fundamentalist Christian. I have a personal relationship with Jesus, tho I'm sure he looks at me at times and goes 'Dude, you know better! Shape up!' But I try. Been married almost 21 years, have 1 son, another baby on the way, and an amazing wife. 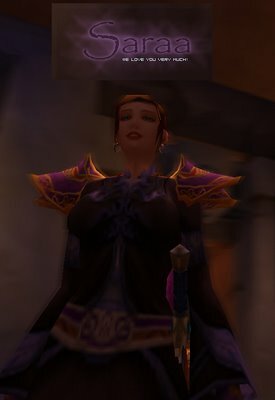 I was invited to Grief by a character named Phace, a cute little female gnome, who, when I first heard his voice, was obviously male. In World of Warcraft lotsa guys play women. Never really seen it go the other way tho. Hmmm... Gotta think about that... I was in Grief until just recently. As a former guild member of Saraa's guild, I can say that we all looked forward to her logging in. We knew she was a bit wacky, but caring, always taking time for personal chats, always helping when she could, always making each player feel like part of a family. Somone once asked me how we made decisions in Grief. My reponse was that we listen to Saraa and typically do what she asks, since we love and trust her. I found out that Saraa was Sarah was a TG female not that long ago. This whole concept is new to me. But since I got to know Saraa well online, she trusted me enough to share this part of her identity with me. This online bond consists of trust and friendship. Though I was surprised to find out about Saraa's biological situation, she has always been female to me. I am still assimilating this new info about Saraa into my perception of her. It is still strange to me. And even if the fact that I need to assimilate this at all is offensive to some, it is still the reality of the situation. One thing I know about Saraa tho is that she will always be a person I will want as a friend. Another is that Saraa will always be willing to be a good friend. 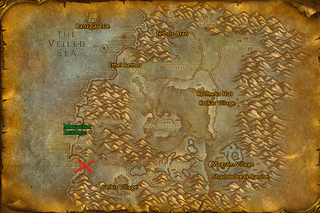 These are the important things I learned about Saraa in World of Warcraft. I'm glad we touched your life. You also touched ours. I really appreciate your comments Shayne! I am amazed how in a game like that you make friends who become *real* friends, even though you may never see them in real life. I remember when you joined, you interviewed me for half an hour to make sure it would be a place suitable for your wife and son. I'm glad you decided it was or else we'd never have met.